Each year I set aside one day during the third week in December to catch up, buy those last few Christmas gifts, and add some final decorating touches before our annual Cocktails & Carols soirée. Today is that day and when I’m at home, I can promise you that A Very Murray Christmas will be playing the background. To say I was giddy the first time we watched it would be an understatement. If you’ve seen in or plan to, here are a few fun notes/facts to save you from the post-Netflix google rabbit hole! 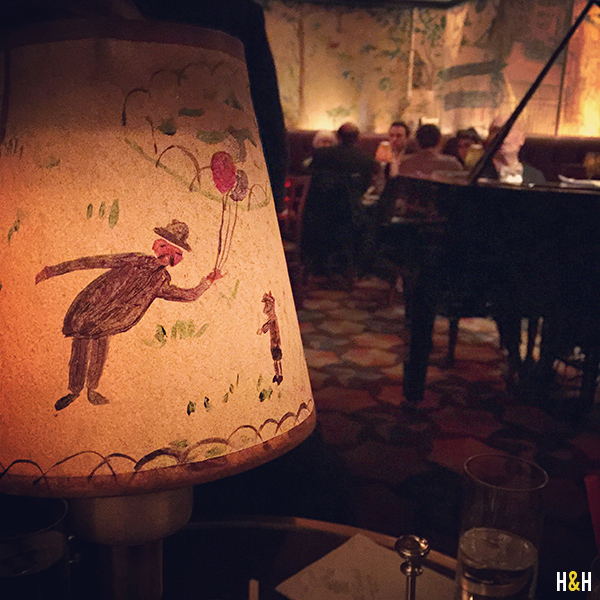 Bemelmans Bar, located on the first floor of The Carlyle, has kicked off more than one magical evening for us in New York City. I’m particular to this bar for a few reasons but the main one is the incredible artwork that covers every inch of the place down to the lampshades. The murals were painted by Ludwig Bemelmans, best-known for his Madeline series, in exchange for lodging when he and his family lived at the Carlyle for a year and a half. 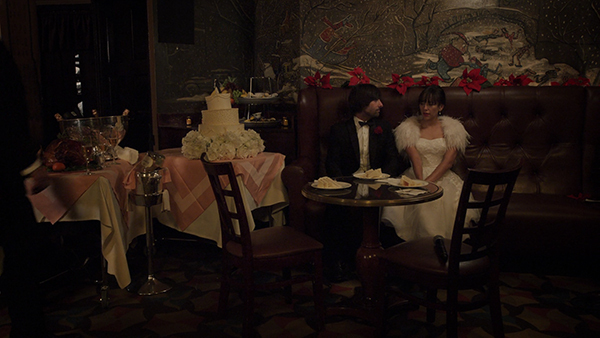 My very favorite scene in the bar depicts winter in Central Park complete with snowing and ice skating. Bemelmans hand is unmistakable. 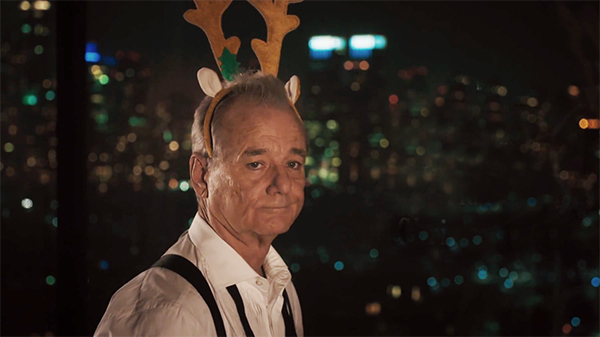 While I would argue that A Very Murray Christmas is best enjoyed while sipping champagne, here’s another idea. 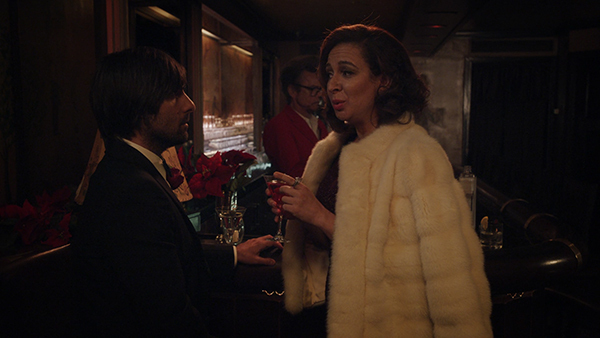 Maya Rudolph refers to her drink as a “soiled kimono,” and being the cocktail hour devotees that we are, we needed to know what that was. The drink is a reference to one of the original writers and creators on SNL: Michael O’Donoghue. It’s a cocktail referenced in one of his “Mr. Mike’s Least-Loved Bedtime Tales,” and when Bill Murray announced his death on stage at SNL, he toasted with a Soiled Kimono. The drink is meant to be garnished with a butterfly but Maya’s is garnished with olives. To each his own. If you spent the first half of the movie looking at the bartender (& his fabulous hair) wondering, “Why do I know that guy?” It’s because David Johansen played the taxi driver in Bill Murray’s other holiday hit circa 1988: Scrooged. Me: */gasp/* This is what the inside of my brain looks like. Husband: Everyone is wearing either red or sparkly, and there’s a bari sax playing. Me: And George Clooney serving cocktails. Obviously I will be needing everything Miley is wearing. And silver glitter reindeer antlers. Alright, I’m off to run errands. 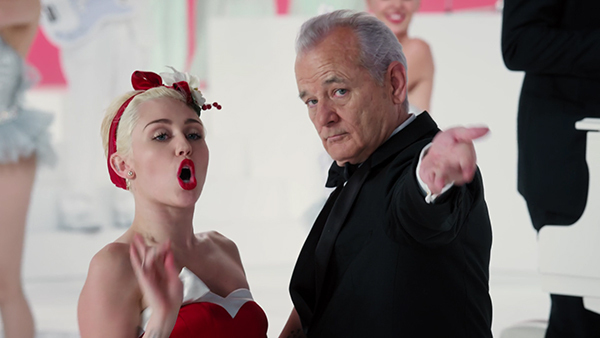 If you’ve seen A Very Murray Christmas: Did you love it as much as I did? Mistletoe: I made this mistletoe years ago, here’s a link to the how-to if you want to make your own! My favorite sparkling rosé, Moët & Chandon, looks festive this time of year. 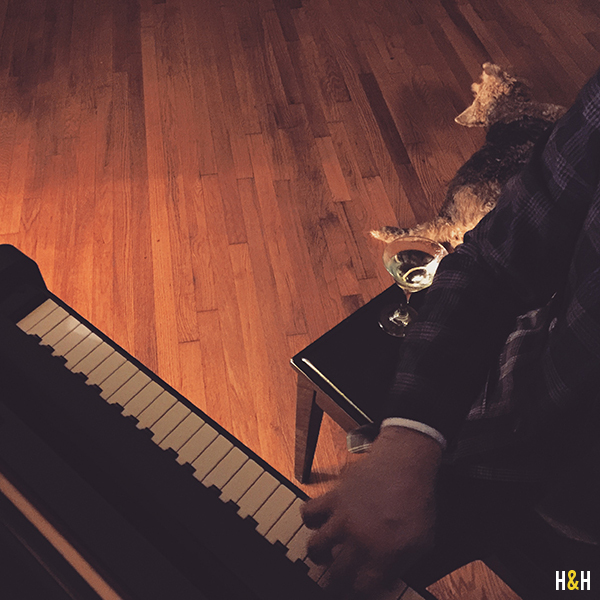 But if you’re looking for something stronger, High West Whiskey has a smoky flavor that is perfect to sip by the fire! I apologize for my absence last week from the interwebs. Between work, colds, and an oh-so-necessary staycation, I found myself taking time away from the cellphone and the laptop in favor of cut paper, yarn, and lots of books. But, I’m happy to report that I missed you! So this week we’ll get back on a regular blogging schedule. I’ve been thinking about Christmas content a lot so please consider yourself warned! *While I usually don’t have sponsored posts, you should know that Wood Underwear called me up about including them this season. We met them on our last trip to NYC and genuinely love their stuff. Thank you for sponsoring the links that are included on Hannah & Husband! It seems like the first week in December is the busiest for me this year, but I have no complaints! Holiday designer-ing is in full swing as exhibited in this little snapshot above. So here are a few peeks at the week so far. Monday night I made Joe’s Leftover Turkey Gumbo while sipping martinis and dancing in the kitchen. 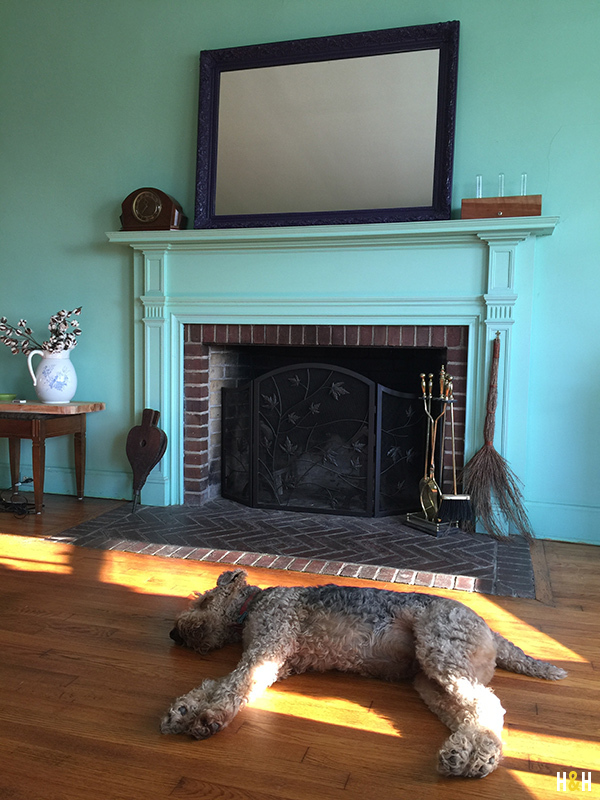 With Husband playing Christmas tunes in the parlor, I confess that I was in such a blissful state I accidentally doubled the roux. So I just made twice as much gumbo! That little happy accident is now safe in the freezer waiting for another rainy Monday. If it is cold and rainy where you are, might I suggest spending tonight cuddled with bae watching Netflix and coloring? 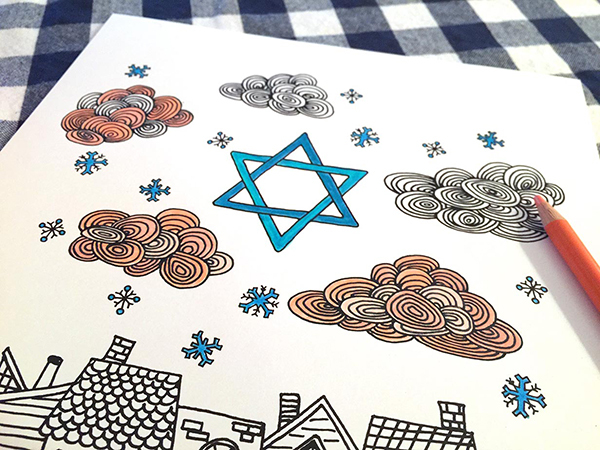 Hanukkah begins on Sunday, and I doodled a couple of Hanukkah-themed coloring pages for DIYNetwork.com. The one above may be my favorite yet! 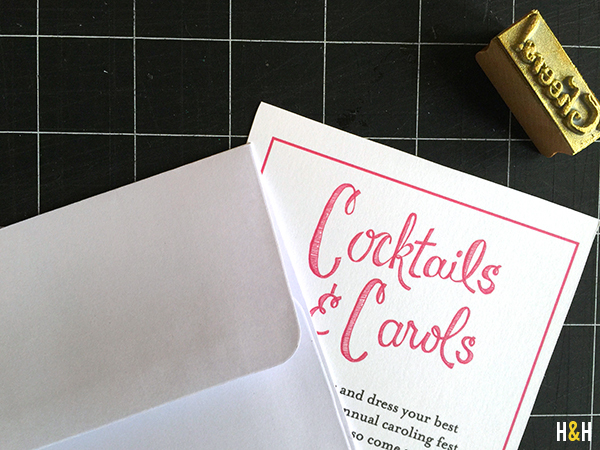 Speaking of the holidays, I sent out the invitations to our annual Cocktails & Carols party today! Fa-La-La-La-La! 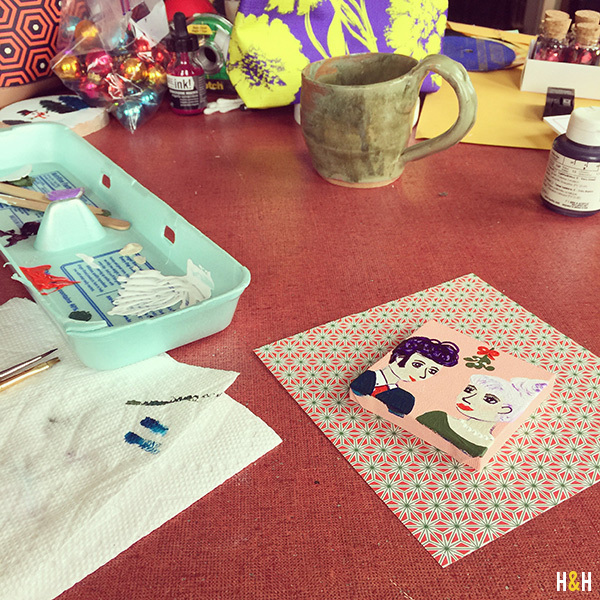 I’ve had so much fun making holiday pretties using different mediums lately. 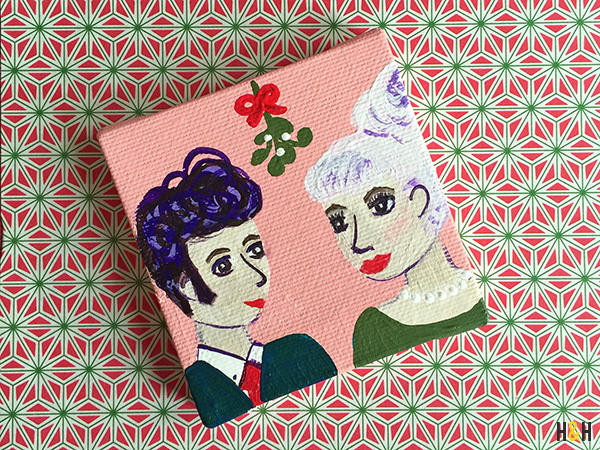 I painted this little couple on a mini canvas for the AIGA Knoxville ornament auction on Friday night. If you’re in Knoxville, come on down to The Basement Art Studio and bid on ornaments from local artists! Finally, if you’d like a little more crafty inspiration, I profiled The Crafty Lumberjacks for DIY’s Made + Remade blog this week. 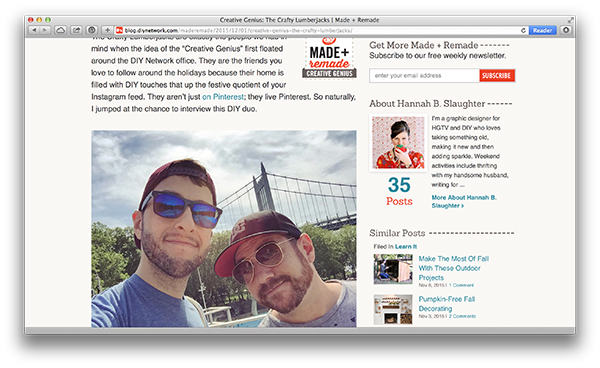 This pair make me want to spend an evening drinking whiskey and crafting in Queens! Hello! I hope you have recovered from a lovely Thanksgiving weekend and are ready to jump into December (TOMORROW OMG!). I am happy to report that our first holiday in the new house was a success! 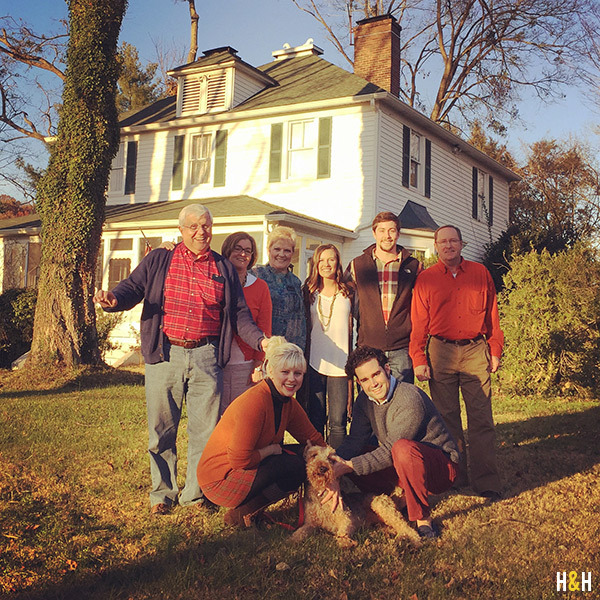 We had a relaxing day with family and even managed to set up my favorite tripod and snap a few pictures this year. I’m usually terrible at remembering–Thanks, Haley! We captured both of these by hanging my favorite tripod with an iPhone mount from a branch and a curtain rod. Then, we just used the timer on the iPhone. 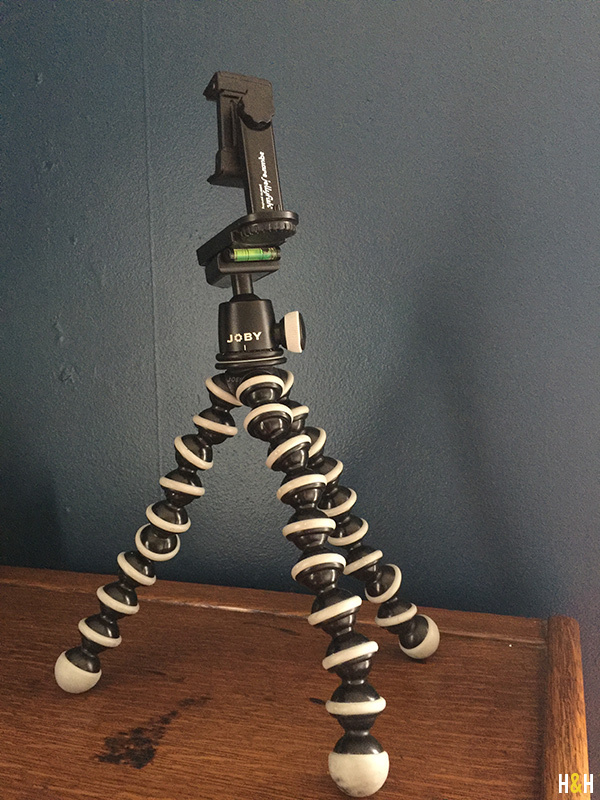 With the holidays coming up, I highly recommend this set-up: JOBY Gorillapod + Jellyfish iPhone tripod mount. The idea of the Gorillapod is that the bendable legs can balance anywhere or wrap around things to suspend your set up. I use it all the time! We’ve even set it up during parties to capture time-lapse videos. So rad! Before I go, I thought I’d also share this video from Thanksgiving morning! Just me and Abby Ham chatting it up about recipes at 8am. Click here to check out all of the recipes from the Stories from the Kitchen series! 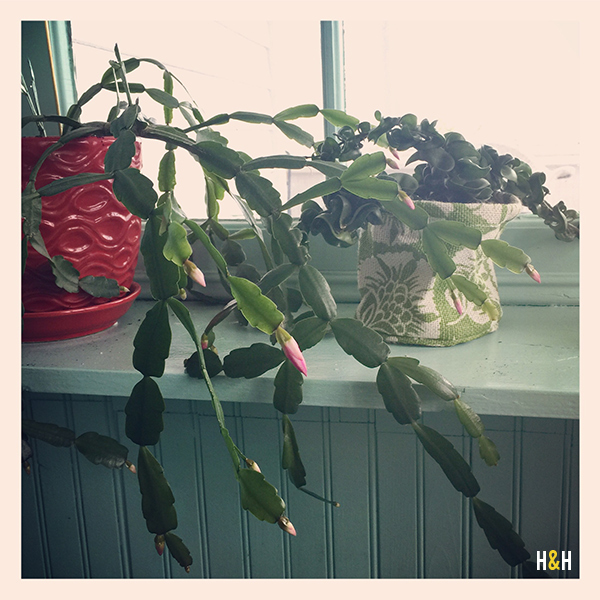 The Christmas cactus I got from a clipping of WooWoo’s has bloomed for the first time in it’s 7 years here! Rivermont is magic. Happy Wednesday! At this time tomorrow you’ll be snuggled up on the couch watching Al kick off the parade at 77th & Central Park West. But today? Today you’re stuck in your cubicle counting down the minutes until you can make a run to the grocery store for (insert random item here). So I thought it would be fun to share few random links I found as well as a few pictures from Rivermont. I posted this instagram the other night so I thought I’d share a few more pictures. 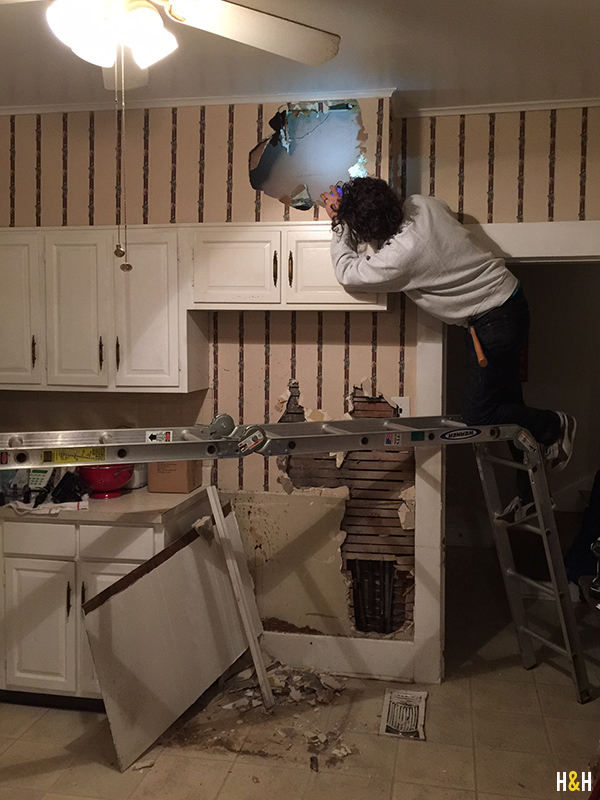 Basically, we’ve decided that the kitchen is going to be a long process, but we’re determined to go ahead and start redoing it little by little. First up, we’ll be switching out the old appliances for some used ones that we bought. Then, we’ll be moving the laundry from a small room in the kitchen to the second level. Since we plan on taking down the walls anyway, I came home to this set up the other night. Why yes, that is my husband in a sweatshirt. 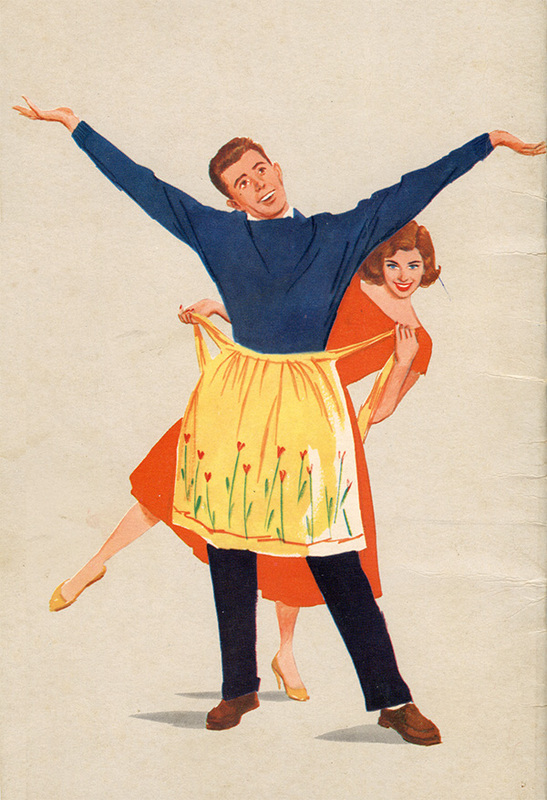 Demo is one of the few household activities with such a loose dress code. 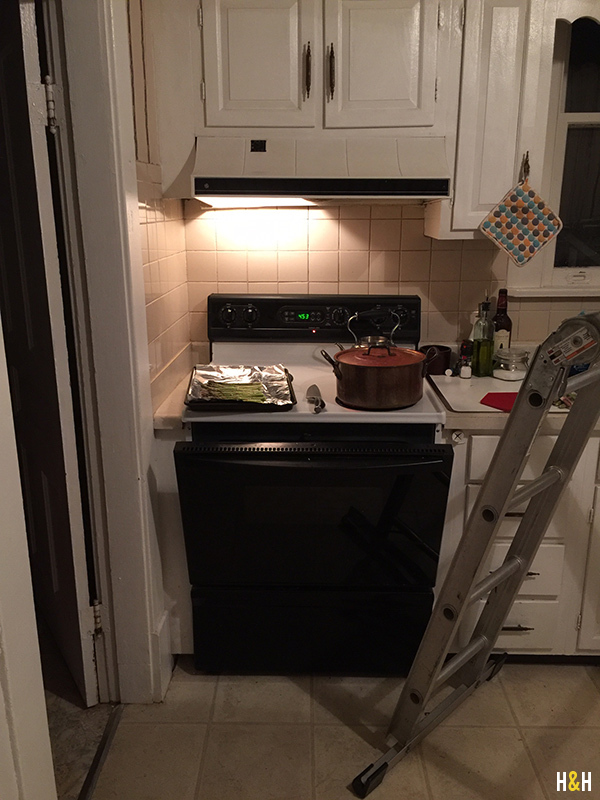 The ladder made cooking dinner a little hilarious. But demo has begun, and I’m so excited! There’s a plumber here this morning running a gas line to the kitchen. Huzzah! So here’s the view from today’s workspace. That dog always manages to find the sunshine. 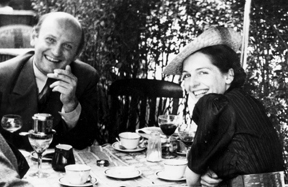 I didn’t think it was possible to love Julia Child more after reading My Life in France, but this article by Julia Moskin in the New York Times did just that. It recalls how the Childs’ phone would ring incessantly on Thanksgiving with strangers that had questions about their turkey. Finally, we are watching West Wing again. (YES, AGAIN! Don’t judge me!) 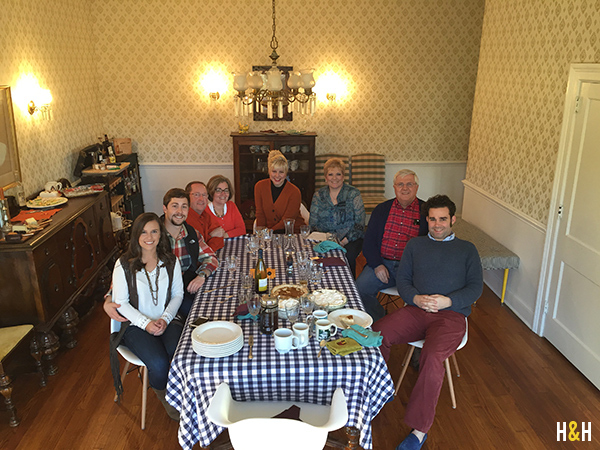 So here’s a little Thanksgiving clip to remind you that while Julia is no longer with us, someone is still waiting by the phone to assist with your Thanksgiving questions and concerns. With only 2 days to go before the big day, I’ll be spending my evening prepping pie crust and polishing silver. With that in mind, I made a new playlist yesterday suitable for all your baking, cooking, and dancing in the kitchen needs. Listen below or click here to follow this playlist on Spotify. We all have those talented friends that make us envy their style as well as their DIY prowess. Today, I’d like to introduce you to one of mine. Liz Gray has impeccable taste, and she is always up for a party. She also happens to be a senior editor for HGTV.com and is one of the lovely ladies behind the blog I Heart HGTV. 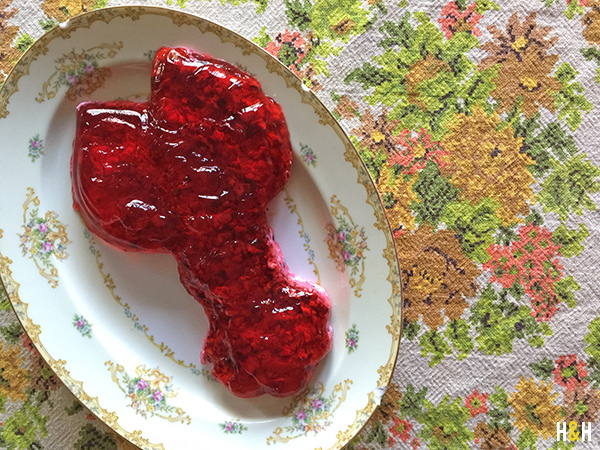 Liz always manages to bring a little sunshine wherever she goes so when she sent me the recipe for Cranberry Thankagiving Jello with the note that it is usually made in “Grandma Pat’s copper chicken and lobster molds,” I couldn’t help but smile. Of course it is. This retro sparkly dish is delicious, and will also give you an excuse to add a new character to the Thanksgiving table. My first memories of cookbooks are of my Grandma Pat’s 1950s cookbooks, from Julia Child’s the Art of French cooking to the 1955 edition of the Better Homes and Gardens cookbook. Each member of my family had their own section they gravitated to: My dad and sister were the bakers, making piled-high fruit pies. I loved the fashion and the almost lacquered look of the food in the photos — have you ever seen a ham shine like that in real life? My mom, though, was all about the aspic chapter. Tomato aspic. Beef consumme. They were all good jelled, she assured us. I can’t say I’m a fan of either of those, but I am most definitely a fan of her annual Thanksgiving Jello mold, always made during the dead of night on Thanksgiving Eve. Think of an apple-cranberry salad suspended in cranberry jello; it’s equal parts jello mold and cranberry sauce. 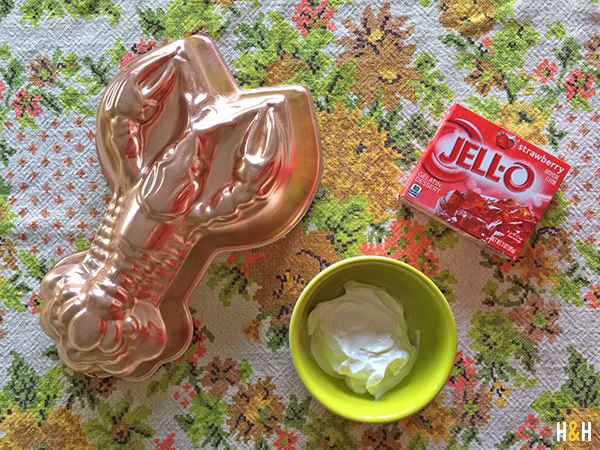 To bring it full-circle, my mom always uses Grandma Pat’s copper chicken and lobster molds. It tastes better than chicken or seafood gelatin and is much more dramatic with its deep cranberry hue atop lettuce leaves. Here is the recipe, as written by my mom. Boil water. Dissolve Jello in 3 cups boiling H2O. Put 1 tray of ice cubes in measuring cup. Cover with cranberry-raspberry juice to make 3 cups. When ice dissolves, add to Jello mixture. Set about 1/4 of the Jello liquid aside and leave out of fridge. Put the rest of the Jello into 2-3 molds and place in fridge for 1- 1.5 hours, until somewhat thickened. In the meantime, pulse the food processor to chop apples, cranberries and pecans until finely chopped. Add 3 teaspoons of sugar to this mixture and stir. When jello is thickened slightly, add the cranberry/apple pecan mix. ( I just blend it in to the top in the mixture, rather than all through it, to leave some plain Jello on the bottom.) Mix the reserved jello with the sour cream (or yogurt) and pour a layer over the top of the fruit and nuts in the Jello. Return to the fridge for about 4 more hours, or until firm. To unmold, dip mold into lukewarm water just until sides loosen… but not until liquid:-( Unmold quickly on a bed of greens. To reduce recipe: For each packet, you need one cup of boiling water and 1 of cold liquid. The ice is not necessary, but helps it to gel faster. Decrease your additions accordingly. Last year I used too much stuff, so be careful. A nice even layer spread over the top of the jello is best. Then mix in slightly. Last week, I introduced you to our friend Joe Garcia. Today, he’s sharing a recipe inspired by his days as a rogue culinary freshman in Louisiana. Warning: I will most definitely be instagramming this dish when I make it next weekend! Here’s Joe’s recipe for Leftover Turkey Gumbo. There is one thing I love, that signals the handoff from Thanksgiving to Christmas (or Chanukah, we don’t leave anyone out) and it is Leftover Turkey Gumbo. We don’t do much on Black Friday, since my beloved is up like an overcaffeinated Amish with a gnawing conscience, and she stays gone all the livelong day, as does most of the distaff side of our friend roster. So Black Friday is spent in social hibernation, plotting and scheming regarding weighty matters potable and edible. This recipe was cobbled together with the influence of a dear college friend’s mother many, many epochs ago. As a 17 year old freshperson away from the comfort of a Miami home, Louisiana cuisine possessed both an insanely exotic appeal, as well as approachable and recognizable aspects to someone from southernmost Florida. The real big difference was the flavor profile, relying more on chile heat to counterpoint richness than with citrus/vinegar acid as I had known until then. In no time at all, I was gumbo-ing up a storm, in an electric wok (!) which was useless as a wok, but ideal for this purpose and easy to conceal from the prying eyes of the dorm’s R.A., he of the suspicious and distrusting nature, and saddled with a zeal for confiscation of the implements of civilized nourishment. This skill stood me in good stead, especially on quiet weekends on campus (when cafeteria fare was especially limited) and I could put out a couple of wooden crates and lawn chairs and hand gumbo off to girls passing by. 1- Turkey is, in certain relevant and applicable respects, a big chicken. 2- Gumbo is, for our purposes, soup. 4- I have eleventy squillion pounds of leftover turkey. 5- I live in sunny, tropical So. Florida, basically the factory outlet for fresh shrimp. So I came up with this. Now, the beauty of this recipe is that even with a substandard moisture-free turkey, you can still make your tastebuds “do the Wave” and if you are the sort of person saddled with an obsessive kitchen streak, even burly men will weep openly in joy. Preheat the oven (!) to 350F. Put the oil and flour into a 5 to 6-quart pot (a Dutch oven is great if you have one) and stir together. Place on the center rack of the oven, uncovered, and cook for 90 minutes, whisking every half hour. All right-thinking Louisianans consider this step to be outright heresy. Embrace and live with it. Once the roux is done (it will look like semisweet chocolate), carefully remove it from the oven and set over medium-high heat. Add the onions, celery, bell peppers and garlic and cook, stirring maniacally for 7 to 8 minutes or until the onions begin to turn translucent. Add the tomatoes, salt, black pepper, thyme, cayenne pepper, and bay leaves and stir to combine. Dribble the shrimp/turkey/whatever stock as you whisk nonstop. Drop the heat to low, cover and simmer for 35 minutes. Add the sausage and filé powder while stirring constantly. Off the heat, add shrimp and turkey to pot, cover and allow to sit until the shrimp JUST turns pink, about 5-7 minutes. Toss the bay leaves. Season with salt and pepper and serve with some Louisiana-style hot sauce to provide additional heat to those who like it that way. This is traditionally served with white rice, I like something along the jasmine/basmati spectrum…just mound it on a shallow soup plate and spoon the gumbo around it. Click here to follow Joe on Twitter, and add his blog, Basic Civilization, to your reader. I work for a huge company and never is this more apparent than when people come up and say, “Oh, you work for Scripps. Do you know ____?” *sigh* “No.” Nine times our of ten my answer is no. But when a friend heard I’d be traveling to NYC on a more regular basis in 2012, she was kind enough to set up an introduction with a coworker in New York named Mallory Viscardi. Our first meeting consisted of tacos on the High Line and lots of talk about food and husbands. I don’t think I’d ever met anyone who cared so much about cookbooks and the perfect cookie recipes but there she was, and I wanted to be her friend. Three years later, I’m happy to say that thanks to the power of the internet, that worked out quite nicely. She and her husband moved to Nashville, have the cutest little baby girl (who is the star of her Instagram), and the food on her blog, Country Mouse Confessions, is more swoon-worthy than ever. So needless to say, I was thrilled when I received her story. There’s something about this time of year in the kitchen that makes me miss my own grandmother so much while feeling closer to her at the same time. Mallory’s story reminded me of that, and also reminded me why I love the internet so much. I love that Mallory can share this recipe with all of us so that we can share in her memories of Mimi. I don’t know about you, but I’ll be going cinnamon shopping today! In my (big, Irish) family, as soon as the clock strikes midnight after Halloween, The Holiday Season officially begins. And that means feasting. Now my father’s mother, my Mimi, was magical. 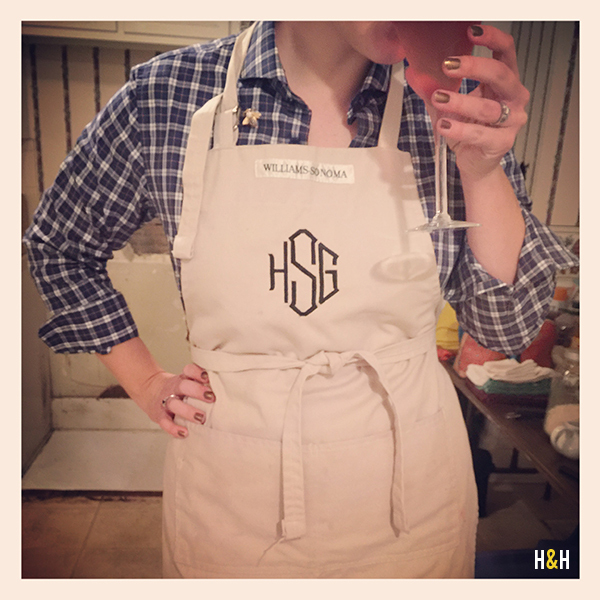 She was special every day, but there was something about the dishes she made for the holidays that really made the wonder of the season dance to life. 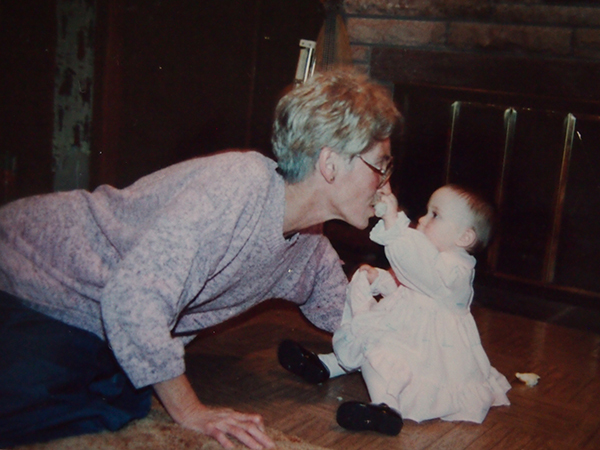 It took years after she passed away for the holidays to feel special again. She ran the house from her kitchen, a place where some of my earliest culinary memories live: the magical way flour floats through the air like fairy dust when you knead bread, the way cookies rise and brown in the oven, the way the whole house smelled when her signature spice blend was used in anything she made (cinnamon, cloves, citrus). It’s with that signature spicy scent in mind that I make this cranberry dish each year, in my Mimi’s honor. Just a whiff of the cloves, cinnamon, and citrus take me back to those special days I spent perched on a chair at her counter, face smudged with molasses or chocolate, watching her create magic one ingredient at a time. 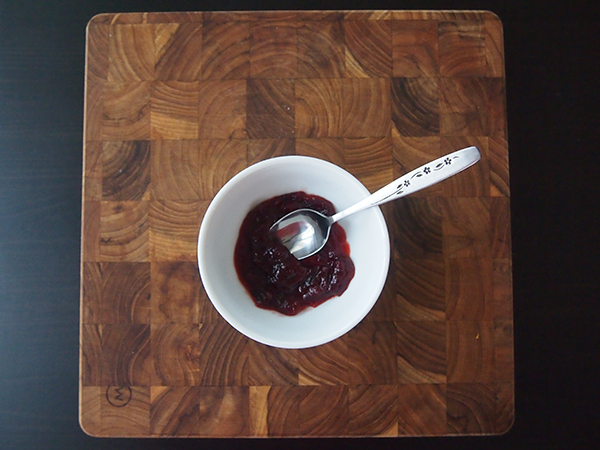 I’m not going to lie to you… Everyone in the family grumbled the first year I made this cranberry sauce, being loyal to the gelatinous glob that comes from a can and tastes something like sugary paste. “Don’t mess with tradition,” they whined. Your family might whine, too. But I promise you, fight the good fight against bland, flavorless cranberry sauce and within a bite or two of this dish even the most grumbly of holiday guests will come around. The bright, aromatic flavors in this dish celebrate cranberries as they were always meant to be enjoyed at the holiday table. I know most home cooks don’t stock more than one type of cinnamon in their pantry, but I strongly encourage you ahead of this holiday season to explore the nuances between Ceylon and Cassia. Each has its own signature scent and flavor, and you’ll find using the right cinnamon (or a combination of both) will take your holiday dishes to a whole new level of extraordinary. I’ve included a note about where I order mine at the end of the recipe for you. Additionally, if you’re feeling fancy or adventurous, you can also swap meyer lemon in for the orange (using zest and juice from 1½ meyer lemons) and you’ll get a dish that more acutely plays up the natural and delightful tart-sweet flavor of cranberry. In a medium saucepan, combine all the ingredients plus 1½ tablespoons of water. Cook over low heat, stirring to dissolve the sugar and combine the spices, juice, and water into a syrup, until the cranberries soften, around 10 minutes. Increase the heat to medium and cook further until the cranberries burst, another 10-12 minutes (depending on how chunky you want it, cook longer for more burst cranberries / a smoother overall texture). I smash mine down with a spatula toward the end of cooking because my family prefers it more like a sauce; poke at it until you find a texture that looks delicious to you. Let cool to room temperature, and you’ll notice the liquid thickens up as the natural pectin in the cranberries works its magic. 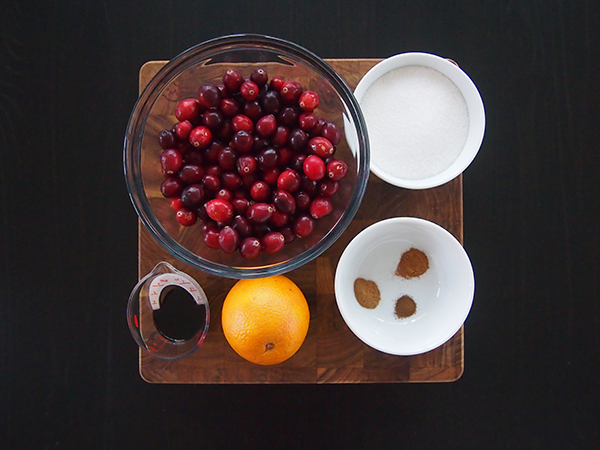 Now all you have to do is try to keep from eating the whole bowl of cranberry sauce before guests arrive. You can make and store this in the fridge in an airtight container up to a week in advance. I like mine best after 2-3 days, when the flavors from the cinnamon and cloves and orange have really bloomed. And you can find the cinnamons I use from Savory Spice Shop online: Ceylon, Cassia. 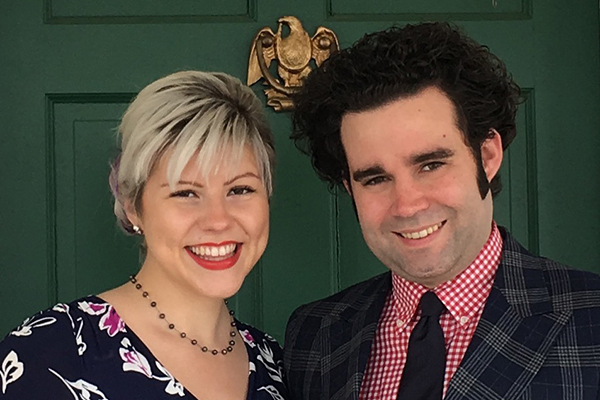 Thanksgiving is nearly at our throats and, as this is the one holiday dedicated to the principle that one ought freely engage in lucullan self-abuse and be grateful for the opportunity, the motto of “What ought we drink?” is heard echoing throughout the top floors of JMG Tower in ringing baritones. 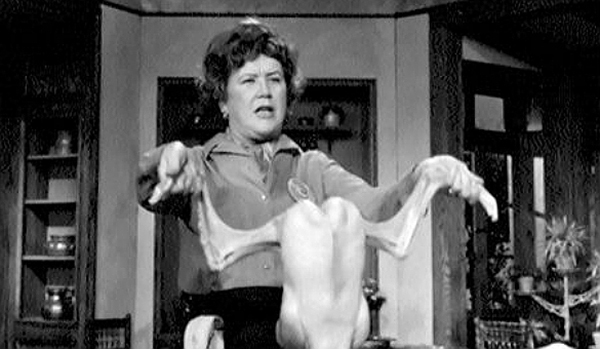 Passersby accost me, women of a certain age and lurid disposition sidle up to me in the produce section of our local supermarkets, and incomplete foodies look upon us pleadingly. They all are aware of the searing need for vinapedic guidance. Which brings us – calloo, callay! — to today, your day of potable deliverance. In order for us to tell you what you ought drink, we must first start with what you must specifically not drink: Beaujolais Nouveau. This is not some sort of atavistic Francophobia or anti-Gallic editorial policy or viticultural jingoism. It is based on the hard fact that Beaujolais Nouveau simply doesn’t make sweet, sweet music with the typical Thanksgiving Day menu. The marketing wizards will tell you Beaujolais Nouveau “goes with everything.” Which is a yes-and-no proposition. It is simple enough and fruity enough and et cetera enough to not stand athwart the groaning board hurling vile abuse at your palate. But that’s hardly a rousing endorsement, is it? Mind you, this isn’t limited to Beaujolais Nouveau; the Usual Suspects (even when they avoid the dreaded International StyleTM) are all in trouble with the foodstuffs of gratitude. There is only one wine that has the muscle to cope well with the sage and pepper inflected turkey’s dark meat and white meat, and the cornbread, and the sausage bedecked stuffing/dressing, and the gravy and the cranberries and even that thing with the green beans and the canned fried onions and condensed soup your least favorite aunt brings every year. We’re talking about Zinfandel. Sadly, most Zinfandel gets recognition for “white Zinfandel” which is a role for which it is catastrophically ill-suited, i.e., to become a wine that is little more than a wine cooler without training wheels. No, no, no. We’re talking real Zinfandel. It even has the happy characteristic of not being one of those grapes that has been planted up one continent and down the other. It’s a cheerfully American thing, this Zinfandel. Now, if you are having a Thanksgiving bash with 50 of your closest friends and family some of whom might be considered, in technical terms, philistines, you’ll want to pick a more accessible and affordable Zinfandel than if the party consisted of 20 or 8. Basically you want something with soft tannins, cherry-berry fruit, decent acidity and a good spice backbone. Here are the choices depending on how colossal your festivities are, from largest to smallest. Click here to follow Joe on Twitter, and be sure to check out Basic Civilization during the month of Decemeber!